While the Old City and Hohensalzburg Castle were year-round destinations, there were a number of places off the north bank of the Salzburg River that beckoned to be visited. In 2002, as I made my way through the wintery streets from the train station toward the Old City, to my left was a tall hill that looked to have a spectacular view of the Old City. This was the Kapuzinerberg, topped with a monastery (Kloster) that looked like a fortress–complete with moat and protective wall on all sides. Unfortunately because of the conditions, I was only allowed to go up so far as it was very icy and treacherous. Thus, on my 2008 return in the summertime, I made it a point to get back up there and capture as many great shots as I could. I happily discovered that the Kloster occupied one corner of a very large park and I decided to include a full circumnavigation around the mountain. On a sunny summer day, it was fantastic. But first, about the Kloster and its position over the Old City. Getting to the Kloster was no easy task. First, one had to take several hundred (well, I didn’t count but it felt that way) very steep steps up the cliffside. On top was a walkway, also steep, that included fourteen small yellow huts like the one in the first picture depicting one of the Stations of the Cross. The Stations is a Catholic tradition in which believers reflect on their own lives as they recall the Lord’s Passion from his sentencing to carrying the cross to his death and raising from the dead. This shot also shows the steps to the Calvary which believers would climb on their knees during the Stations. The Kapuziner Kloster is shown above during wintertime. 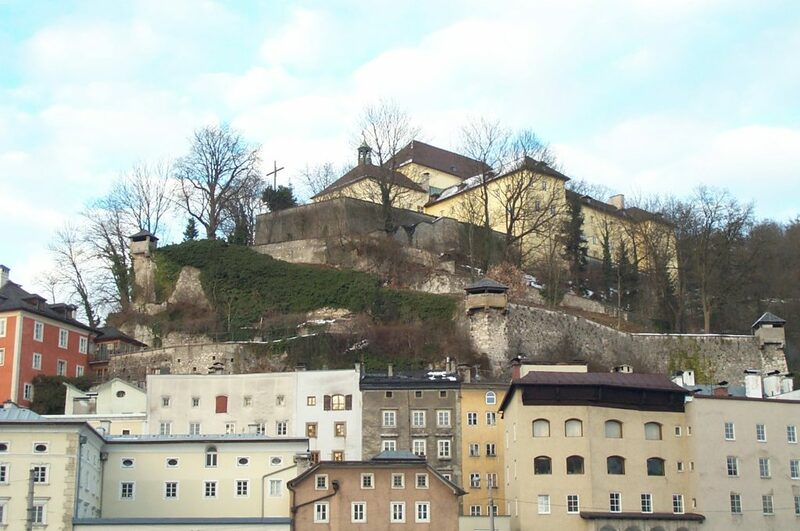 In this scene, taken from the New City below, you see the Kloster building, the exterior walls, and the way the Salzburgers built up all around the hill. The backmost row of residential buildings basically have no back — they are practically (and some completely) built into the cliff. This was something I found occasionally around the city. People literally built tall residential buildings into the cliff, with only the front having any windows. I wondered about the air circulation or lack thereof. But I digress. When I went back in 2008, the Kloster lands were open and I was able to venture on the grounds. 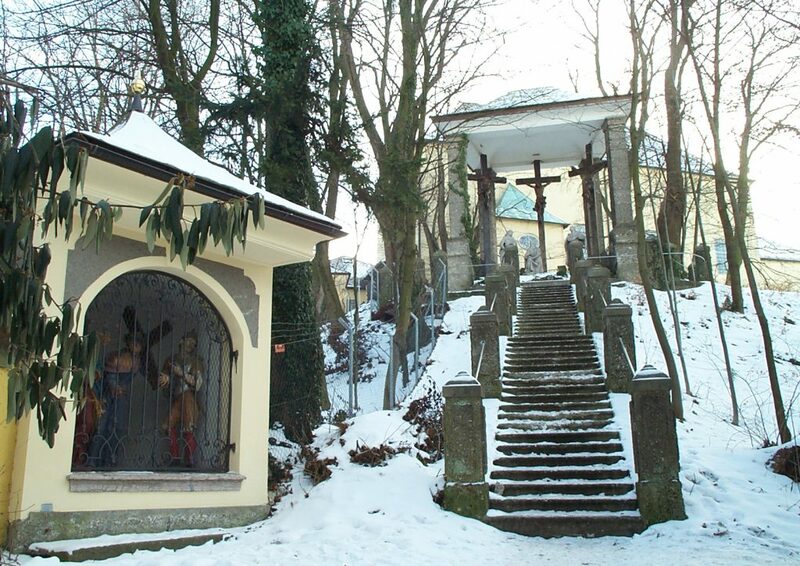 I followed the 14 Stations of the Cross up the Kapuzinerberg roadway through the guardhouse arch at the northwest entrance and onto the grounds. The monastery building is plain, which one might expect. The interiors that I was able to visit, however, were gorgeous. 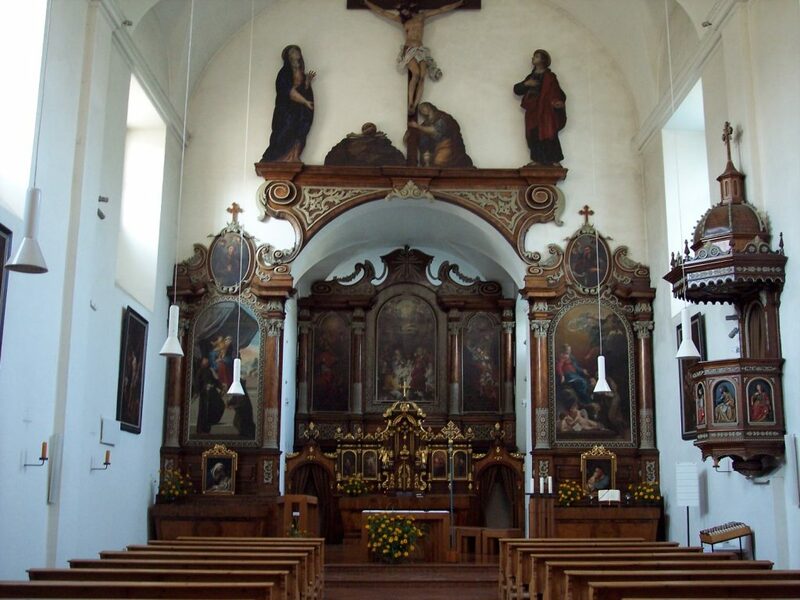 The third photo below is a shot from inside the main chapel, which is decorated similarly to many churches I visited in Austria and the Catholic sections of Germany. The views from the monastery walls were terrific. I had a great look at the Hohensalzburg from the southern wall and could see the Altstadt and the Salzach River below very clearly. But the Kloster sat at the far southwest corner of the Kapuzinerberg Park, extending all along the ridge overlooking the city. From the northern wall, I noted how much higher the ground went and saw a few exposed buildings in the distance, so I ventured further up. 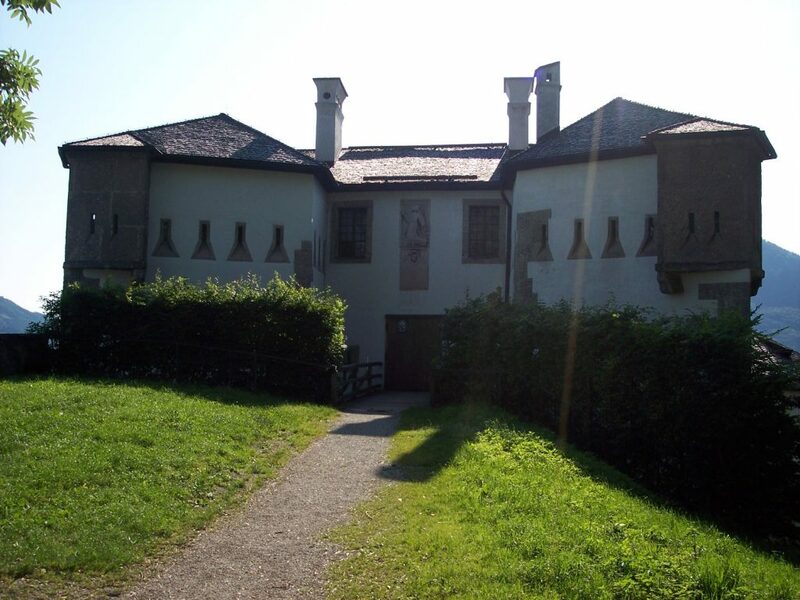 The building I saw is shown in the above photo, the Franziskischoessl located at the Park’s northwest. The roadway did not go directly, rather it wound around in circles up the mountainside before reaching this old fortress near the top. It is now listed in the Salzburg Tourism pages as a great place for weddings and other special gatherings. 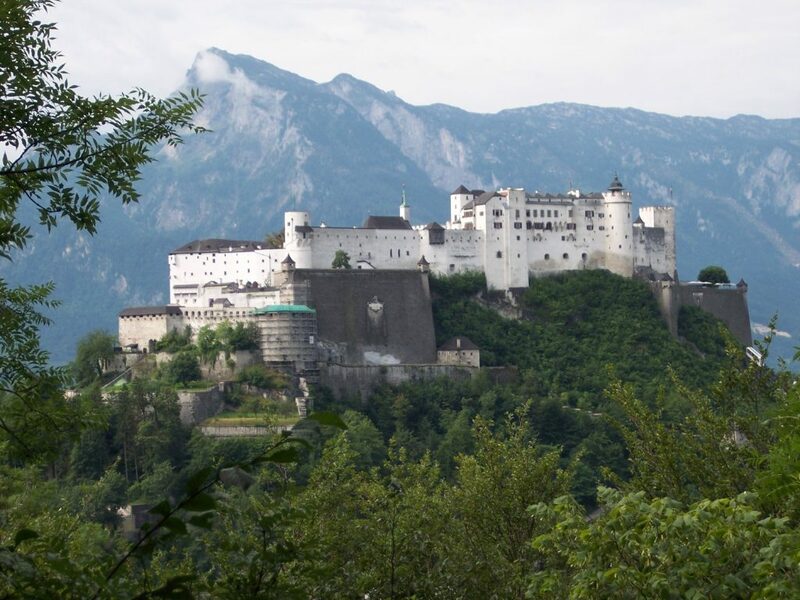 The attraction is plainly evident in the next photograph which I took from nearby — it is a perfect view of the Hohensalzburg. (I must mention that in 2008, much of the ground between the Kloster and the Schloessl was clear, whereas a Google Map photoview shows much of the ground grown in and forested. Visitors nowadays might not get the same views I did). Venturing around the park, I found vast stretches of fortifications that were still intact. The mountain was heavily fortified back in the days of the 30 Years War, and undoubtedly gave the Salzburgers a tremendous advantage over any invading armies. The Schloessl was not the highest point I went, in fact there were walking paths reaching the mountain’s highest point which in 2008 was marked with what looked like an open bonfire pit. It was more difficult to get a view of the Old City from there, but the views of the New City were clear. 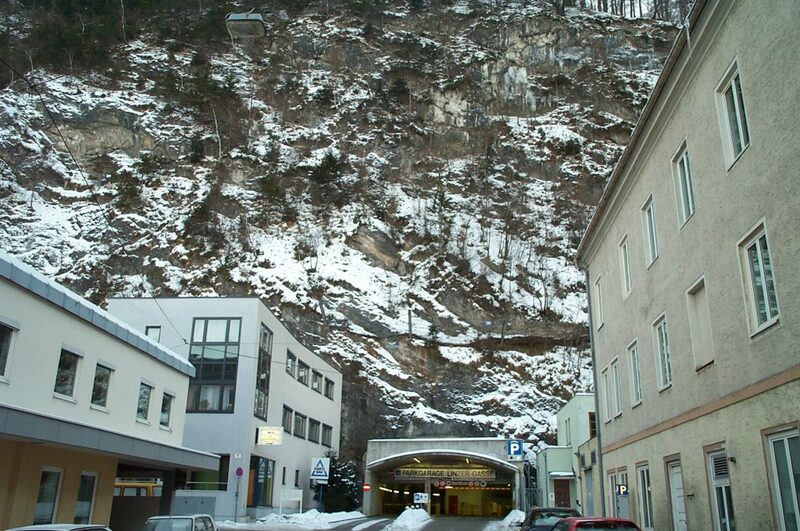 The final photo, above, is a novelty shot I took from below the Kloster as I made my way back to the train station in the 2002 visit. I had to laugh when I saw it because I couldn’t believe that they would dig out an entire parking garage into the sides of a cliff. But they did! It’s the only time I’d seen this, perhaps you readers can tell me there are others. The Kapuzinerberg was a good healthy walk — worth doing if one is in terrific shape and one has time to spend. It took me about two hours to cover the entire park in the summertime, which included lots of photo taking opportunities and water consumption. But I was glad I did it. You just can’t beat the views from up there!! !